Discover the mystery of the oceans! Join us for visiting the Aquarium. From one hand, we will contemplate exhibitions of all type of submarine life. 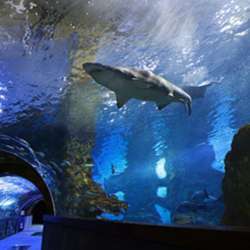 From the other hand, we will see the event based on feed to submarine life (sharks etc...) by scuba divers of the aquarium! Audio guides will be as support. Concerning to the price of the entrance, it costs 9€ for students & unemployeds. Please, bring documentation. I'm looking forward to meeting you and introducing you to other members!